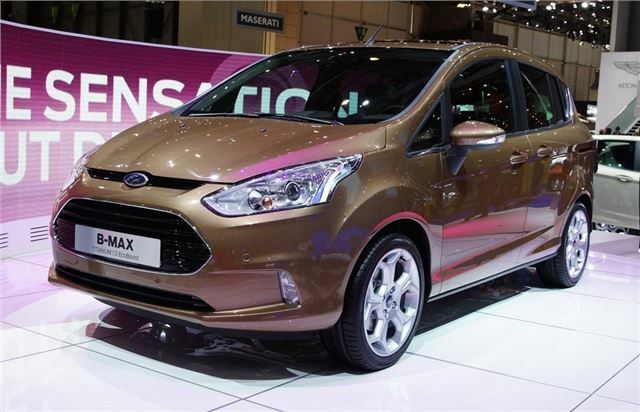 Ford has officially unveiled the new B-MAX compact people carrier at the Geneva Motor Show. The model was first shown as a concept at the 2011 show and will go on sale in the UK in September. Prices haven't been announced yet but the B-MAX is expected to cost from around £12,500. It will be available with Ford's new 1.0-litre EcoBoost petrol engine which was recently launched in the Focus range. The three-cylinder engine develops 125PS and averages a claimed 58.9mpg. TDCi diesels will also be in the engine line-up. Ford says the B-MAX has 'exceptional space and versatility for such a compact vehicle' with the brand promising a high quality cabin and generous standard equipment levels. Based on the same platform as the Fiesta, the B-MAX is around four metres long (so just 11cm longer than a Fiesta five-door), but shorter than the new C-MAX. But the big feature is the doors. With both front and rear doors open there is impressively easy access, with an aperture measuring more than 1.5 metres wide, so it's ideal for fitting child seats in the back or for more elderly passengers. Cleverly the centre pillars are integrated into the doors themselves. The Ford designers spent several days observing drivers with families and their daily routine so that they understood what owners wanted in a small people like the B-MAX. Of course the big challenge with a pillarless door system is safety as the middle pillar is a crucial part of the body structure. Thanks to the new doors layout, the rear seats and the front passenger seat can be folded flat to create a large, convenient load platform, to accommodate everything from bicycles to flat-pack furniture. According to Ford, the B-MAX can carry large item, more than 2.3 metres long, plus they can be loaded through the side doors. To deliver the required strength in side impacts, the structure of both front and rear doors has been significantly strengthened - with ultra-high-strength Boron steel in key load-bearing areas - so that the door frames work together to absorb energy like a 'virtual B pillar'. Special safety interlocks and reinforced latch mechanisms ensure that the doors remain firmly fixed to the roof and floor structure during an impact, and enable the front and rear doors to act together to protect the occupants.